Those who love chicken will also love this long-established restaurant, where the specialities are spit roast chicken, and grilled and roast meat dishes. The varied menu also offers fish, seafood and vegetarian options! 30.07.2015 - Kikiriki (the Spanish version of Cockadoodledoo) first opened in Cabo Blanco in 1998 and Carmen and Antonio’s business has grown from strength to strength ever since. 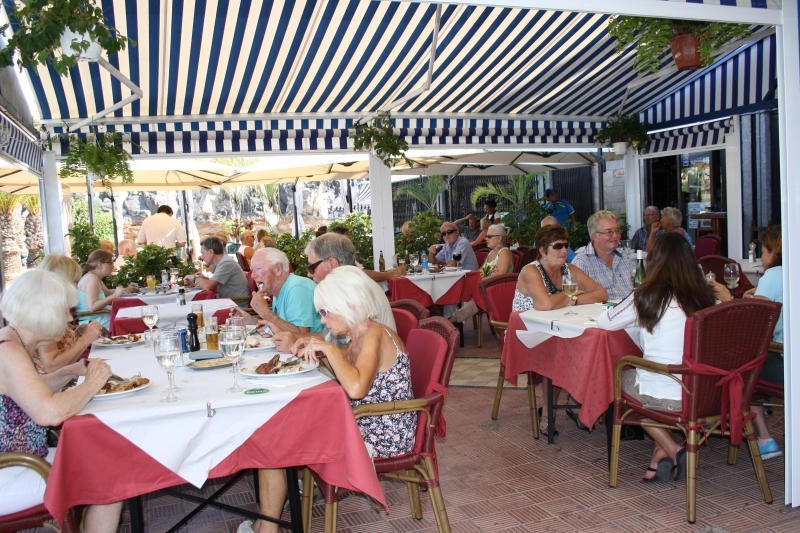 They moved to the ApoloCenter in Los Cristianos and have recently moved again to much bigger premises on the front line of the same centre where they can cater for up to 80 guests. Kikiriki has a friendly family atmosphere, with a light, airy terrace fitted with comfortable chairs and screened with plants. The atmosphere becomes busy after sunset with the chink of knives and forks and the buzz of happy chatter. Inside, the warm tones provide a more intimate ambience, with the tables dressed in red and white. The speciality here is chicken, but there is an amazing choice right across the menu, from six types of savoury breads, through soups and crispy salads, meat, fish, shellfish, specialities which include gratinated spinach cream, puff pastry with spinach and blue cheese, onion cake with smoked salmon, and more, plus 23 different pizzas choose from, and to round off your meal, some fabulous home-made desserts. Not listed on the menu, but nevertheless also specialities at Kikiriki are suckling pig and succulent roast lamb. We started with the gratinated spinach cream which was warm with fresh ground black pepper and sprinkled with enough cheese to add piquancy but not overwhelm the fresh spinach; truly superb and highly recommended. The chicken, which had been spit roasted, had previously been dunked in Kikiriki’s secret marinade mixture, and then constantly basted with the marinade mix and its own juices. The result is crisp skin, succulent meat and a taste sensation that will make you want to return again and again. Like all the main course meat and fish dishes it comes with a choice of wrinkled Canarian potatoes, chips or chunks and thick slices of potato fried with garlic. Being garlic fans, we chose the latter and were not disappointed. The dish automatically comes with a choice of sauces. Hot tomato does what it says on the label – lush with chillies and garlic. The pepper sauce is creamy and contains crushed and whole peppers for a full but not overpowering flavour. The Roquefort is a soft creamy sauce with a strong hint of that fabulous cheese, which accompanies the meat without taking over. The last choice is the house sauce, Kikiriki, a delicious, slightly sweet and almost fruity blend of fresh tomatoes with cream and tarragon. In these days of mass production, to taste such a wonderful selection of obviously homemade sauces was a gastronome’s dream! We recommend you try to save room for dessert (easier said than done!). On the day of our visit, the choice was a creme caramel with cream and walnuts, chocolate mousse, a lemon cake and an almond cake. Truly scrumptious. Prices for soups and starters start at €3.70, specialities from €4.50, chicken from €7.80 for half or €4.50 for a quarter, and chicken nuggets are available for children. Fish and shellfish start at €9.90 and the fresh meat dishes, which include a succulent lamb chops and fillet steaks, start at €11.95. Pizzas begin at just €5.90 and the delicious desserts start at only €3.75! Beers, soft drinks and spirits are available from the well-stocked bar, with San Miguel on draught and Reina, Heineken and Dorada beers available by the bottle. Wines can be bought by the bottle, carafe or glass. There’s a careful selection in addition to the house wines, with some old favourites and some great choices such as Ribera del Duero. Some wines are available off the list for a limited period. Without exception, all the clients we spoke to were there on repeat visits. Some had been eating at Kikiriki since the Cabo Blanco days! Why do they come back? “For the food, it’s as easy as that,” one group of four friends told us. Another long-time customer said, “It’s great to have somewhere to come and bring family and friends, knowing that the food will be excellent, the service professional and friendly and on top of that it’s great value for money!” Visit this restaurant soon, you’ll no doubt want to make it one of your regulars too. To make life easy, there’s a car park at the ApoloCenter and a bus stop right outside. Kikiriki really is something to crow about! Gallery: Something to crow about! Produced with news.CMS in 0,0708 seconds.